This model capo is made specifically for the ukulele! At a glance it looks like our banjo capo, but it closes onto a smaller neck, and accomodates a slightly wider fretboard. 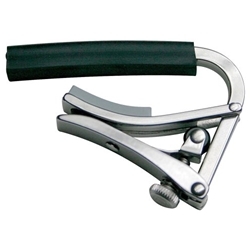 Testing on many brands confirms this capo is a perfect fit on all tenors, sopranos, concerts, and baritones ...except the occasional baritone with a very large neck. In these cases, our banjo capo is a good fit.